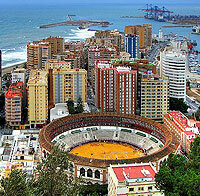 Spain was first called Iberia, a name given to the land by inhabitants of African stock. The name was supposedly based on the Iberian word for river, Iber. When these desert folk arrived in Spain they saw the country as a land of great rivers. But any creek would probably have appeared impressive to the desert-dwelling Iberians, who reached Spain during the centuries of prehistory, possibly as early as 3,000 BC. When the Greeks arrived on Spanish soil, around 600 BC, they referred to the peninsula as Hesperia, which means "land of the setting sun". When the Carthaginians came around 300 BC they called the country Ispania (from Sphan, "rabbit"), which means "land of the rabbits". Strangely, the long-eared, timid creature appears on early Iberian coins. 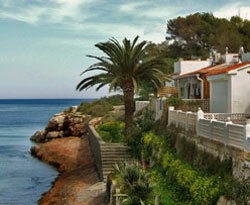 Over the centuries people have been coming to Spain, but never in greater numbers than in our century. Many of those who came chose to stay, and made Spain their home. As did the Phoenicians, Romans, Vandals and Moors in ages past, so many of those who visit Spain today end up finding themselves a home in this land that offers culture and nature in astonishing variety. People flock to its sun-kissed sandy beaches. Ancient castles dot its diverse landscape. Quirky modern buildings and loud discos as well great storehouses of art are found in its cities. Spain is a prosperous modern country, yet its cherished traditions are maintained. Its rich cuisine is so dominant that international franchises are rare. Each regional cuisine has its own particular character, but the staples of Spanish cuisine include ham, chorizo sausage, and paella, a seasoned rice dish with numerous regional variations. Spain is also known for its wines. Spaniards love good coffee and enjoy intellectual discussions over a cup. Starbucks, though present in big cities, is largely disdained by traditional locals. Spain's climate is varied. The coasts are temperate, and a region like Andalucia has a gentle and pleasant climate, but Spain's vast central plateau has a rather extreme climate. Madrid has short, blisteringly hot summers, and cold winters. There are lovely beaches on Spain's coasts, though for large stretches of the coast it is hard to see the sand because of the large numbers of North European bodies. Spain has very interesting and attractive islands, with good beaches - the Balearic Islands in the Mediterranean, and the Canary Islands in the Atlantic. Spain is second only to Italy as the country having the most UNESCO World Heritage sites. Highlights include the medieval Moorish cities of Granada and Cordoba, the early medieval churches of Oviedo, the medieval walled city of Avila and the city of Alcala de Henares, the late-medieval cathedral of Burgos, the walled town of Cuenca, and the alcazar and Roman aqueduct of Segovia. Spain's long history can be traced beyond the Romans, to the Iberians, Celts, Phoenicians and Carthaginians (who founded Cadiz, the oldest city in Europe). In the eight centuries between 711 and 1492, the Moors, originating from North Africa and, earlier on, from the caliphate of Damascus, built a tolerant and artistically productive civilization in the south of Spain, with a splendid capital in Cordoba, the largest, richest and most sophisticated city of medieval western Europe. It took the Christian Reconquista seven centuries to retake the country fully from the Moors, culminating with the conquest of Granada in 1492, the same year that Columbus reached America. The Spanish Reconquista was thus followed at its heels by the Conquista of the Americas. 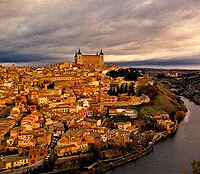 After the Reconquista there was an efflorescene of renaissance architecture, which includes the town and university of Salamanca, the palace of El Escorial, much of the cities of Toledo, Seville, the palaces and stately homes of Caceres, and the cathedral of Santiago de Compostela. The Spanish Empire then expanded to include most of South and Central America, Mexico, southern and western portions of today's United States, the Philippines, Guam and the Mariana Islands, much of Italy, Sicily, cities in North Africa, as well as parts of France, modern Germany, Belgium, Luxembourg, and the Netherlands. Yet by the second half of the 17th century Spain's hidden weaknesses, its essentially feudal economy, combined with imperial overstretch, began to take their toll, and a long period of decline began. In the early 18th century succession issues ended in the installation of (French) Bourbon monarchs on the Spanish throne. The first century of their reign was the period of the Spanish enlightenment "el siglo de las luces " which saw many important cultural and intellectual changes in Spain, but not substantial enough in economic and political terms. By century's end, with Europe engulfed in the Napoleonic Wars, conflict within the Spanish dynasty gave Napoleon the opportune moment to install his brother Joseph as king of Spain. The Spanish people fought the French "invader" in a devastating guerilla war (whose human suffering was captured in Goya's drawings) whilst the deputies of the Spanish Cortes, convoked in Cadiz, promulgated the 1812 Constitution declaring sovereignty as emanating from the Spanish people and for the (absent) king to reign as a constitutional monarchy. It was also during these years of turmoil that the American colonies one after the other broke away from the Empire. Restored to the throne after Napoleon's defeat, King Ferdinand VII reinstalled absolutism. It was in opposition to absolutism that, through the rest of the 19th century, Liberalism emerged as the political agenda of diverse groups in Spain aiming to transform and "modernize" Spain according to their respective political and economic programmes. Conservatism however prevailed, and overturned attempts at fundamental reform. The 19th century ended with the "Year of the Disaster", 1898, when Spain lost its last remaining colonies (Cuba, Puerto Rico, the Philippines) to the United States. The "Generation of "98" - poets, novelists, philosophers - produced great works of literature in their effort to understand the disaster in moral, historical and philosophical terms. The start of the 20th century saw increasing tension between the social classes, and the authoritarian rule of General Miguel Primo de Rivera (1923-31). A brief flowering of democracy during the Second Spanish Republic was followed in 1936 by an army rebellion under General Francisco Franco, with the backing of Nazi Germany and Fascist Italy. The Civil War was the greatest tragedy for Spain, the result of unresolved conflicts from the preceding century, which had failed to transform Spain. Franco executed thousands of republicans, but cleverly sat out the Second World War. In the 1960s, Spain saw unprecedented economic growth, and made the transition to a modern industrial economy, propelled by thriving tourism. After the death of Franco in 1975, the reinstalled monarchy under King Juan Carlos 1 oversaw the peaceful transition to democracy. Since that day, Spain has seen extraordinary peace, prosperity, and social development.